Essentially, the external defense problem of the continental defense commands after Pearl Harbor was one of preparing to fend off relatively minor surface attacks and, along the Pacific front, air attacks that might be launched from a carrier striking force. But even minor attacks could have caused extensive damage to vital installations and areas, and successful "nuisance" attacks might have had an almost calamitous effect on preparations for offensive operations overseas. After the Pearl Harbor experience the War and Navy Departments were also peculiarly sensitive to the prospect of the criticism that would certainly follow any sort of surprise attack that they had not prepared to meet as best they could. While the early 1942 west coast air strength looked impressive on paper, it was actually subject to many qualifications, the most important of which was that only 39 of the bombers and 239 of the pursuit planes were ready for combat action.15 Rather acute bomb and ammunition shortages continued, and the deficiencies in personnel qualified to operate the planes were even more serious. On 12 March the Fourth Air Force commander noted that his bombardment squadrons were "all dangerously short of experienced pilots and navigators, and almost totally lacking in bombardiers and trained gunners." 16 On 24 May the IV Interceptor Command reported that nearly half of its assigned pilots were not qualified to fly the planes with which its four groups were equipped-one of the four having more planes than qualified pilots. This report concluded with the observation, "Considering the handicaps imposed by lack of sufficient suitable airdromes, inadequate housing facilities, unsuitable aircraft radio equipment, [and] mass replacement of fighter units by new units with less than two weeks training, the efficiency of the Command is excellent.17 The continued preoccupation of the Fourth Air Force with training was both inevitable and proper under the circumstances, but it certainly reduced its efficiency as a defense force. borne radar eventually helped to solve the problem, but not during the period in which a Japanese strike remained a serious potential threat. In the first half of 1942 the protection of the Pacific coast against carrier action had to depend very largely upon the capabilities of the interceptor and antiaircraft commands for close-in detecting and defense. warning, in view of the accurate and detailed information being obtained about the movements of the Japanese Fleet. In the meantime, as soon as the extent and significance of the Japanese defeat at Midway became clear, the Army had begun to reduce its defense forces on the west coast. General DeWitt ended the special alert along the coast on the morning of 8 June, and by that date the War Department had started to recall the air reinforcements that it had rushed to the Western Defense Command during the pre-Midway period. 47 By 24 June the bomber strength of the Fourth Air Force had been reduced to 3 heavy and 60 medium bombardment planes, far fewer than it had had before the May emergency. Both the local naval command and General DeWitt continued to urge the allocation of more heavy bombers for long-range offshore patrols, but the War Department turned them down.48 The combat teams of the Army Ground Forces' divisions within the Western Defense Command remained on an "on-call" status for emergency defense use, but under a new arrangement that did not seriously interfere with their training.49 During the summer of 1942 the Western Defense Command lost two of its antiaircraft regiments, but otherwise its assigned ground combat strength was not materially changed until the end of the year. The Eastern Theater of Operations, activated on 24 December 1941 under the command of General Drum, contained at the outset a far larger strength in Army forces than was ever assigned to the Western Theater. During the last week of December its ground units included four army corps, eleven infantry and two armored divisions, fifteen antiaircraft regiments, numerous harbor defense forces along the northeast coast, and a large miscellany of other forces. Yet this strength was deceptive, not only because a large proportion of the units were unready for action but also and more significantly because the War Department never intended to bottle up such large forces in defense of the Atlantic front. INFANTRYMEN ON BEACH PATROL. study incoming vessel. 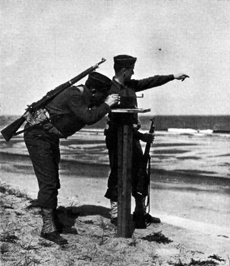 Even as this system of beach defense was being substantially improved in the winter of 1942-43, the chances of any sort of enemy attack on the coast line were growing increasingly slimmer. An Army intelligence estimate of 8 December 1942, although acknowledging the possibility of submarine, surface, and air attacks on the Atlantic and Gulf coasts, nevertheless held that such attacks were highly improbable and in any event incapable of doing any great harm unless the course of the war underwent a significant change.79 Actually, the Germans still had some schemes for attacking the east coast by air, but after the invasion of North Africa it looked to the War Department as if it could safely begin a steady reduction of the Army's forces guarding the Atlantic front of the continental United States. In mid-1943 the numerical strength of the forces assigned to the continental defense commands still amounted to about 379,000 officers and men. This figure-almost the peak strength of these forces after March 1942-was actually very deceptive as an index of their combat effectiveness. The First and Fourth Air Forces contained almost one-third of this strength, and their activity had long since been devoted principally to training units for overseas service. Ground combat troops within the commands numbered about 185,000 officers and men, of whom about 140,000 were in antiaircraft and coast defense units. These units and their higher headquarters had a large proportion of overage and limited -service officers and men. Thus, when the War Department began its further reductions of continental strengths in July 1943, the number of ground combat units and men within the defense commands that could be sent overseas was actually much smaller than a glance at their paper strengths might have indicated. The amount of flying training being conducted in vital defense areas makes accurate identification of aircraft, a prerequisite to any effective air defense system, an impossibility, particularly with respect to single or small formations of aircraft. 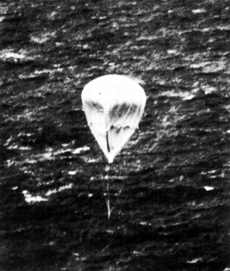 JAPANESE FREE BALLOON approaching the pacific coast. American military and civilian officials naturally suspected a more sinister ultimate purpose. The Army and Navy collaborated with civilian agencies in taking such immediate protective measures as were possible and drafted plans for combating any kind of warfare that the balloon operations might presage. The enemy threats of the last year of the war had no real influence on the reduction and virtual disbandment of the continental defenses begun in 1942. Very few Army aircraft were actually used for defense purposes after the summer of 1942 except in the war against the submarine. The ground defenses reached their peak strength in effectiveness about a year after Pearl Harbor, and thereafter their actual strength declined much more rapidly than their numerical strength. After June 1943 the ground defenses were reduced as rapidly as possible under the policy of calculated risk. Hindsight may judge that this reduction should have begun much earlier, but the services had always to take political considerations into account as well as their own considered estimates of enemy capabilities. After January 1944 the continental United States had only token Army forces assigned to its defense, and even these forces underwent nearly a tenfold decrease in strength between then and the end of the war. In August 1945 the Eastern and Western Defense Commands still had a complement of about 17,000 officers and men on duty, but their active defense function had all but vanished.